Despite the heavy rainfall [great timing world], I am so happy to be back at WOMAD festival drinking in some of the best music from around the world at the moment. It wasn't great that the grey and rain had to stay around all day but as soon as I stepped into the arena and saw the flags I forgot about being cold and wet [nearly]. 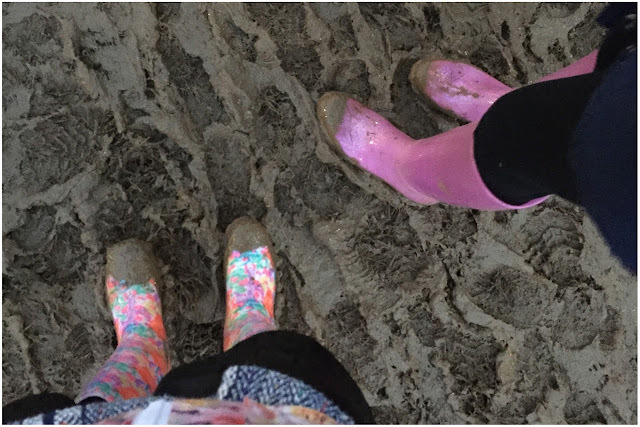 To add to the cheer, today we nicknamed ourselves Wet Cat and Damp Elle, two extremely attractive names for young ladies at a family, friendly festival. We made it work though - had lots of yummy, warming food throughout the day [including a Goan mackerel curry - YUM] and tried to stay in the tent venues to watch as much as we could. Exploring and shopping can be for tomorrow when [cross cross cross fingers] it will be sunny! Cathia: 70, 73 and 29 - the ages of these South African Queens shared proudly mid set. The saying 'age is just a number' was clearly on show for this electric set - so much energy, dancing, smiles and positive spirits. 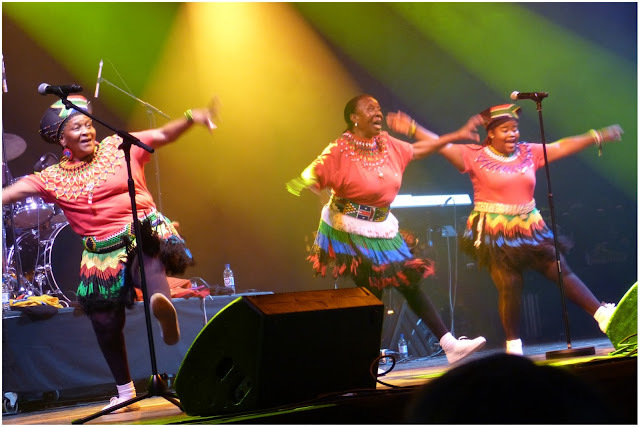 These ladies have been performing since they were in their teens and they are still rocking it with style. 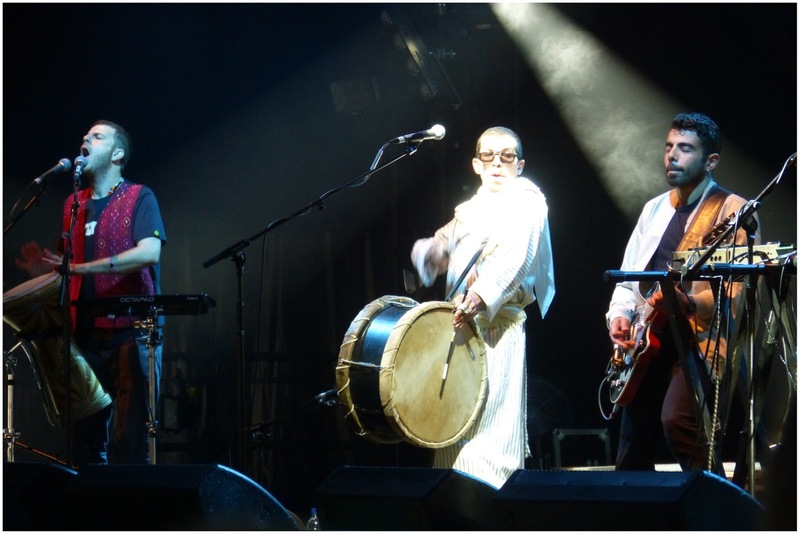 Ellie: This charismatic trio and their backing band were great entertainers and had absolute bags of talent. They were brilliant to listen to and watch largely because it looked like they were having as much fun up on stage as we were on the floor. I only hope to be like that when I hit my 70s. Cathia: Clearly a talented group and very passionate about the topics they covered, but was a little too intense rhythmically for me so we only watched a few songs. Ellie: These guys offered a cool blend of synth alongside more traditional instruments which produced some good grooves. The WOMAD programme had mentioned their rap skills which attracted us but in practice (for the songs we heard) it was a bit more chanty. Cathia: The lead singer had a beautiful voice and overall this was a very captivating performance. However, we only stayed for the first half as the songs weren't as varied as we had hoped! Ellie: When they first started, I was super impressed by this band's enthusiasm and the lead singer's voice. I was a little disappointed when it transpired that they were playing along to a backing track. 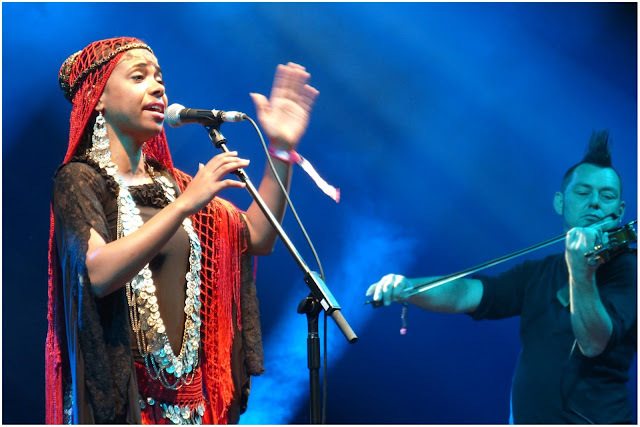 I feel like part of my joy at WOMAD is seeing all the music being created in front of me. Cathia: Although we didn't get to watch this band in person, it sounded like a whole load of fun so now I wish we had! 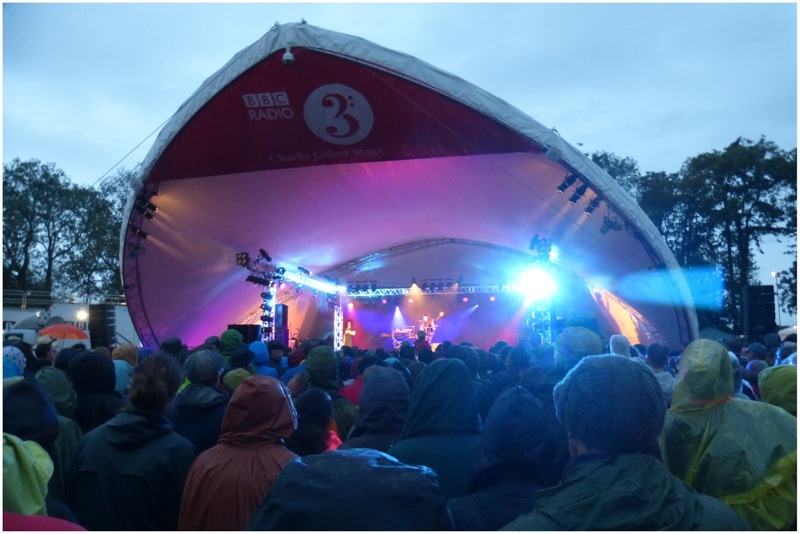 Great beats, fun rhythms and brought a little sunshine sound to a super rainy day. Ellie: As Cathia said, this vibrant band put a smile on our faces on what was a fairly damp and dreary day. Cathia: One of the funnest big bands - we didn't see the whole set but the end part we caught was great. 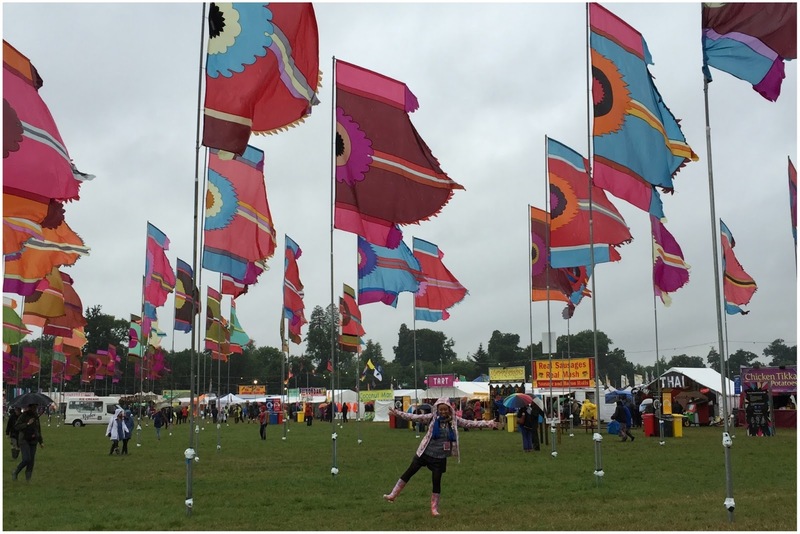 Everyone was bopping along happily under a sea of colourful umbrellas. 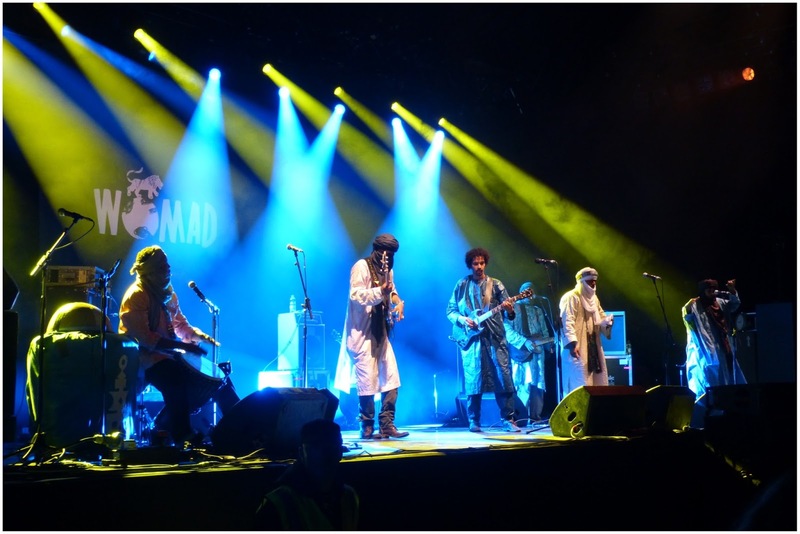 Cathia: I'm probably extremely biased given Tinariwen are in my top ten favourite ever bands but what another fab set! Performance wise, these guys are so tight, the rhythms are captivating, and I instantly forgot that it was raining cats and dogs outside the Siam tent. Absolute legends and an honour to see them perform again - they were great. Ellie: Despite probably having listened to Tinariwen for the first time many many years ago, this is the first time I've seen them live. They did not disappoint. These multi-talented dewds delighted the audience - there was a fantastic atmosphere in the Siam tent. I particularly enjoyed the dancing! Cathia: This set clashed with Tinariwen so we didn't catch the whole thing. However, I was really keen to watch a good chunk as had heard so much about these talented twinsies. Their performance didn't disappoint. A literally stripped-back performance showcasing their gorgeous voices to the max - loved. Ellie: These talented twins captivated crowds at the Charlie Gillett stage which were larger than I've seen for pretty much any other artist. This was fully deserved as they were smashing. Would definitely like to see a full set next time. Cathia: I couldn't get any great pictures of these guys but they were classic hip hop performers. They tried to get the crowd going with a 'who are the party crowd' vibe and looked very comfortable on stage. Although I love hip hop, I still find it a bit disjointed when a relatively more mainstream act is added to the WOMAD bill. 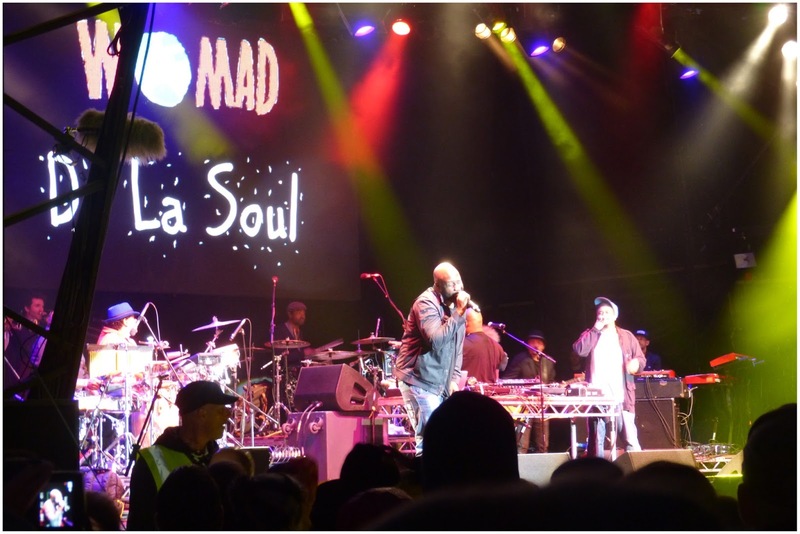 Ellie: De La Soul were an unexpectedly mainstream addition to the WOMAD line-up. Used to performing to big crowds, they wasted no time in engaging in a little audience participation which was quite fun if a little atypical. The crowd appeared to be having lovely time. A re-energising end to the day. bring on Saturday - with SUN I really really hope!